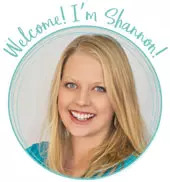 by Shannon Clark in Work from Home | 13 comments | Contains affiliate links. So you’re thinking about starting a blog, but now you’re wondering ‘What should my blog be about?’ These 5 steps will walk you through how to choose a blog topic that’s perfect for you. I get some version of this question from my readers a lot! They know they want to start a blog, and maybe even earn an income from it, but they’re not sure how to choose a blog topic. This is a challenge I totally understand! Choosing a blog topic can seem like such an overwhelming and final decision. Through my five years of blogging, I’ve learned a lot about what works (and what doesn’t). I’ve been blessed to see this blog grow to hundreds of thousands of pageviews a month and a consistent work from home income for my family. Whenever a new or prospective blogger asks my advice about starting a blog it gives me the warm fuzzies. I love blogging, and it brings me such joy if I can help a newbie get closer to her blogging goals. Here are the five steps I would advise any new blogger walk through to choose a blog topic that’s right for your new blog. 1. How Do You Find Your Passion for What You Want to Blog About? Write about a topic you’re truly interested in. In other words, don’t pick a topic because it’s trending on Pinterest this week and you think it might get you noticed. If you want to attract readers and keep them coming back for more, you need more than just a trend. Not only that, but you need the ‘P’ word. I hesitate to use the word passion because it can be such a buzz word with little real meaning, but if you rather: enthusiasm, fascination, even obsession. To write blog posts week after week, month after month, you must be a little obsessed with whatever topic you choose for your blog. So, how do you find your passion? How do you decide what to blog about? Answer these 14 questions to help you find that special thing you’re both interested in and qualified to write about. Do you have a major life experience or achievement can you share or teach? If you had unlimited free time, what would you spend all of it doing? If you had no choice but to give an impromptu 30-minute speech, what would it be about? More importantly, what was the last thing you Googled, but didn’t find a good answer for? What was the last thing you posted to your Facebook/Twitter/Instagram account? Which life stage are you in now? What life stage might you be in, in 5 years? What was the last great conversation you had about? Is there a particular topic your friends come to you for help with? 2. What Kind of Blog Should You Start? I hope answering the questions above helped you to brainstorm some topics that would be great for your new blog. 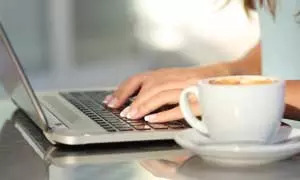 Now, check out the following general categories of blogs to see where you and your passions fit into the blogging world. I bet reading through this list, you’ll have an instinct over which general category of blog you should start. All of these are blogging topics that make money for bloggers across the internet, but keep reading for what I believe will be even more important to your success. 3. Should You Choose a Niche Topic for Your Blog? Some would say you should choose a “niche topic” for your blog. In other words, you should get very specific and not branch out too much. There are some good arguments for this strategy. However, that isn’t the path I chose to take with my blog. Keeping a somewhat broader topic has worked well for me and the long-term success of my blog. As a writer, I would find it a struggle to slog through writing about something that was too limited. Like we all are, I’m growing and learning all the time, and my interests are growing along with me. While I’ve always written about seeking to live a simpler life, the specific topics included under that category have changed somewhat as time goes by. When I was having babies, I wrote a lot about how to have a healthy pregnancy and how to prepare for a natural birth. Now that my kids are getting older, I wrote a little about homeschooling. In some seasons I’ve been excited about decluttering and organizing. And I always love talking about saving money, especially when we were paying off our debt. Helping moms spend more time with their families by working from home is a big passion for me. You can see how all of these ideas fit under the one big idea of Simple Living, but I didn’t limit myself to only one narrower topic. 397 posts later, I’m still going. When you sit down at your computer with a double tall cappuccino to start your blog, make sure you do this above all else. 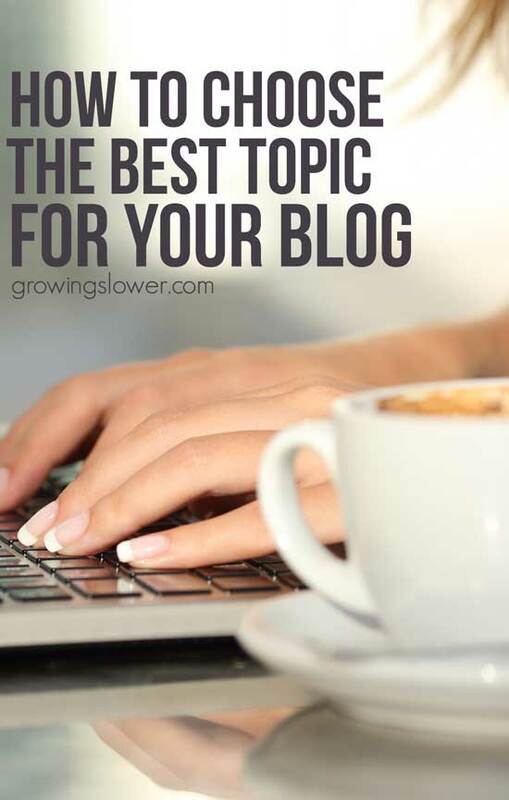 When choosing a blog topic, pick something you can authentically write about. Do you either have life experience or education about the topic or it is something you’re actively learning about? You don’t have to be the world’s greatest expert, but make sure you’re being real. For instance, if you’re a new blogger, don’t write about how to make money blogging. However, it’s totally ok to document your real-life journey of paying off debt or losing weight. Also, don’t pick a blog topic just because you think it will make money. (I know you would never do that anyway!) Your readers will see right through you and it’s a really good way to get sick and tired of your topic and blogging, fast. The number one reason readers come back to any blog is because that blogger shared a little piece of herself. Over time, they got to know her stories, her family, and what is going on in her life in real time. When you’re writing a blog, you’re building a relationship with your readers. No matter what you write about, authenticity is non-negotiable if you want your blog to be successful (and profitable). Your readers might be able to overlook some typos or someone who isn’t a ‘professional’ writer. They won’t mind if your graphics or web design aren’t perfect. As long as you are authentic and share your story, they’ll be much more likely to come back to read your new posts or subscribe to your newsletter. Try and list at least your first 20 blog posts that would be relevant to your topic. If you have a hard time getting to 20, then you may not have enough interest in this topic. Or you may need to pick something a bit broader. One caution: be careful about choosing something from a specific season of life. If you’re going to name your blog Fancy Cloth Diaper Reviews, are going to want to still be talking about diapers in five or even ten years? But don’t worry too much, even if the name and domain (web address) you choose is still pretty easy to change down the road. I know it can seem overwhelming and so final to choose a topic or a name for your blog. But in reality, it can all be easily tweaked, adjusted, and perfected in the future. The best thing to do is to get started and see what works best for you and your readers. You can fine-tune things as you go, but you won’t learn which path to take until you publish that first post. Let me share the words of wisdom my husband tells me whenever I get freaked out and overwhelmed by blogging. Whether you decide to create a craft blog or a food blog or a blog about the 12 tropical fish in your saltwater aquarium, you’re really just writing your story. There might be a million food blogs out there. (Or more.) There’s only one you. It’s the thing burning in your heart that you know you must share with the world. That’s what your blog should be about. Get started. You won’t regret it. If you’re wondering about how to start a profitable blog, especially if you’re on a tight budget, my How to Start a Profitable Blog on a Budget tutorial walk you through exactly how to get started. I’m completely stumped! I have 3 things I’m most passionate about in life- travel, exercising and eating/making healthy food (ie coming up with healthy recipes)! I can’t figure out how to combine them all into 1 blog without it being all over the place. I thought about coming up with healthy recipes using foods that I’ve tried while traveling, but I don’t have enough to write about that and I already have so many food recipes to share that are not from my travels! Ugh???? Well, I’ll share my two cents on your dilemma. This could actually be a pretty well-focused blog topic. Maybe your overall topic is health. You could mainly talk about healthy recipes and exercise. These two topics are wildly popular, especially on Pinterest. Then when you travel or happen to include ingredients from your travels, simply share stories from your experiences. This will help you tell your unique story and connect with your readers. Most of all, my advice is to get started on your blog, and as you write and see what kind of a response you get, you’ll eventually find your place. You may end up shifting gears or even getting more specific down the road, but you’ll never know what works until you try! :) Best wishes with choosing your blog topic! I really liked everything you said here. Thank you for posting. Its inspiring. I would love to start a blog. I was thinking about discussing Depression as I have suffered from it a good part of my life. I would like to offer insights, thoughts. So many people are affected by this. Sometimes as a new blogger it is very challenging to choose a blogging topic. A blogger should always choose a topic about which he already knows something.Even after knowing something a blogger may need to do research so that he can write detailed blog posts. I’m interested in media, fitness and weight loss, family /patenting /momming but I don’t know how to combine them into a single topic. please I need your opinion. Hi Daisy, I would not recommend trying to combine all of those into one topic. If there is one that you have a stronger interest or expertise in, or if you have a specific transformation experience (e.g. with weight loss) that you can share then I would go with that. So, let’s say you go with weight loss, then you can talk about how to do that as a busy mom, and what kind of diet-friendly things you can cook that kids will like too, etc. I am completely stumped on what topic I would like to use for my blog. I am completely passionate about animals, and could potentially write for days and educate about canned hunting or other unwanted cruelty. But on the other hand I am also very passionate about travelling, and my target it to save up to hopefully treck around Japan next Summer. Hi Shannon! I think the deciding factor for which topic would make the best blog is having a specific audience in mind. Try to imagine who would read each of your potential blogs. Are they passionate enough to stay interested and keep coming back to read more? I could imagine that an informative travel blog could be very interesting if you’re able to share pictures and stories from your travels, but then again I love to travel. Does that help a bit? I’m so torn on how to pick a topic. I love clothes, I love food, and I’m working on being healthier. How do I focus? Prisca, I would recommend zeroing in on only one type of person that you can serve through your blog. Pick the option that you truly have the most expertise and experience with and start with that. You can always change your blog topic later, but you’ll never get anywhere unless you go ahead and get started writing. Best wishes with your blog!